For the fictional character, see Amanda Fisher (Ash vs Evil Dead). 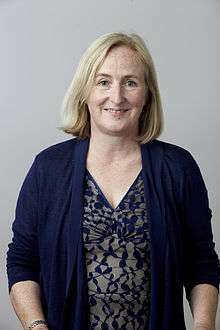 Amanda Gay Fisher FRS FMedSci is a British cell biologist and professor at Imperial College London where she leads the Institute of Clinical Sciences. She has made contributions to multiple areas of cell biology, including determining the function of several genes in HIV and describing the importance of a gene’s location within the cell nucleus. As a postdoctoral researcher, she produced the first functional copies of HIV, providing researchers with access to enough biologically active material to study the function of the virus’s genes. She later became interested in epigenetics and nuclear reprogramming, particularly in white blood cells known as lymphocytes and embryonic stem cells. As of 2016 her research focuses on how gene expression patterns are inherited when cells divide, using lymphocytes as a model system. Fisher was educated at the University of Birmingham where she was awarded a PhD in 1984 for research into antigens expressed during myelopoiesis. At Imperial, Fisher used lymphocytes as a model to analyze how gene expression patterns are transmitted through cell division. Fisher also explored the molecular basis of lineage choice. She studies the transcriptional and epigenetic mechanisms that underlie cellular differentiation and experimental reprogramming. Fisher’s research activities also include pluripotency and reprogramming, polycomb repressor complexes in stem cells, cohesion function in gene expression and genome organization with ikaros family transcription factors (TFs). Fisher conducts her research with a cell biology and genetics approach, using current technologies to address the events involved in maintaining embryonic stem (ES) cell pluripotency versus differentiation towards mesoderm, endoderm and ectoderm, as well as the mechanisms of T cell and B cell lineage choice and differentiation. Fisher’s research includes studies of the methylation of DNA. DNA methylation is a chemical reaction observed in plants, fungi and mammals that is remodeled during development. Multiple routes for DNA demethylation exist in the animal and plant kingdoms. Fisher focused on methylation of the fifth carbon of the cytosine ring and found that 5-Methylcytosine (5mC) removal from the genome requires specific DNA synthesis-dependent and independent processes. Fisher states that methylated DNA can be cut from the genome by hindering its maintenance machinery in dividing cells. She concluded that multiple processes may induce DNA demethylation, thus, there is little conservation between mechanisms in the plant and animal kingdom. Mammals, however, present no clear consensus regarding a preferred mechanism despite previous studies. Fisher reasons that this is because many ways to remove 5mC have evolved and a unified process has not been selected. Fisher also related her findings to the involvement of the 5mC-5hmC conversion catalyzed by Tet proteins. Her results from this research provided new insights in understanding DNA demethylation methods. Another avenue of study involves examining the role of DNA methylation in stable gene repression. Throughout development, most of the animal genome is sustained in a state of transcriptional repression. Fisher suggests the existence of basic mechanisms capable of sustaining repression through multiple cell divisions. This occurs during development. Fisher’s team generated viable DNA methyltransferase (Dnmt) mouse cells to study the effect of DNA methylation on chromatin structure and gene expression. Fisher was awarded for her work with DNA methylation. Her findings encourage new discoveries involving the DNA methylation process and how it can be modified or repressed. Chromosomes and proteins were located by Fisher in living cells using modern tools. This allowed Fisher to image gene regulation in the nucleus. Fisher examined the vertebrate α-globin gene cluster (located on human chromosome 16) and the β-globin cluster’s (located on human chromosome 11) association with heterochromatin domains. Fisher found that the α-globin gene cluster does not associate with heterochromatin domains, lacks extensive CpG site methylation and is DNase-sensitive. Lastly, she found that the α-globin is never expressed. In contrast, Fisher found that the β-globin cluster is DNase sensitive. Acylation and replication timing are different in erythroid and nonerythroid cells. Fisher was better able to examine the significance of nuclear organization for gene expression in the cell because of the ability to visualize compartments in the nucleus. Fisher concluded that for tissue-specific genes, intranuclear location of gene expression is not particularly relevant. Fisher’s research in gene expression illustrated the idea that extensively different strategies function within the genome to achieve tissue and developmental-phase-specific gene expression. Fisher’s findings opened up a new way to visualize the location and importance of gene expression. Fisher’s postdoctoral research involved chromatin structure and gene regulation in the immune system. Development of the immune system and response to infection relies on the activation and silencing of many expressed genes. Fisher aimed to investigate the importance of chromatin structure in gene regulation activities that associate with immunological processes. Chromatin structure is significant because it often determines cell identity and cell memory. Transition from condensed to decondensed chromatin structure takes place before activators of genes reach their binding sites. Fisher utilized several preconceived ideas about relationships between chromatin structure and gene regulation. The remodeling of nucleosomes activates transcription. Increased condensed chromatin structure is associated with gene silencing. Propagation of decondensed chromatin at loci in DNA replication and division helps cells recall which genes are expressed with exposure to a specific stimulus. Fisher used Interleukin 4 (IL4) genes as a model for investigating the activities involved in acquisition and heritable maintenance of a decondensed chromatin assembly. She studied Interleukin-12 subunit beta and interferon-β genes to measure how their vicinity to the promoter of the mechanism is involved in the remodeling of specific nucleosomes. Fisher also considered how this contributes to prompt activation after a cell has been stimulated. Fisher also used a restriction enzyme accessibility assay to observe nucleosome transformation upon macrophage stimulation. She found that remodeling is restricted to only one nucleosome and it occurs rapidly. She concluded that histone acetylation located near the promoter increases only slightly throughout activation. This indicates that the loci may fully acetylate in unstimulated cells. Thus, transcription factors can rapidly access their binding sites within nucleosome 1 after being stimulated by a macrophage. Fisher found that a nucleosome-remodeling complex could be recruited by these transcription factors (ikaros family TFs), thus, providing access to the other DNA-binding proteins needed for transcription. Lastly, Fisher found that deletion of conserved non-coding sequence 1 (CNS-1) from the locus has a dramatic effect on immune response to significant pathogens. Deletion of CNS-1 resulted in reduction of expression of the IL-4 gene and T helper 2 (TH 2) cytokine genes. She discovered that that this could be due to a role in establishing an available chromatin structure. Fisher’s research progressed the relation of gene regulation and the immune system. Fisher established future steps that need to be taken in this study area, simplifying the process for future researchers. Fisher’s contributions are recognized and highly cited. Fisher’s discoveries in HIV were extensive and critical for future research of the virus’s characteristics. She produced the first functional copies of HIV, allowing her and other scientists to access biologically active material for future research of the virus’s genes. She determined the roles of several of the genes in HIV. These findings have been significant in studying and understanding different characteristics of HIV and Human T-lymphotropic virus (HTLV). Fisher has supervised a number of PhD students and postdoctoral researchers. In 2003 she was elected a Fellow of the Academy of Medical Sciences (FMedSci) for excellence in her contributions to medicine and society. Fisher received the Women of Outstanding Achievement in Science, Engineering Technology (SET) award in 2010. Her Fellowship of the Royal Society is arguably her most outstanding award for its selectivity of the most eminent scientists, engineers and technologists from the UK. Fisher’s most recent award is the Helmholtz Association of German Research Centres International Fellow award presented to her in 2015. ↑ Fisher, A. G.; Brown, G (1980). "A rapid method for determining whether monoclonal antibodies react with the same or different antigens on the cell surface". Journal of Immunological Methods. 39 (4): 377–85. doi:10.1016/0022-1759(80)90238-0. PMID 7007517. 1 2 Beretta, Chiara Filipe (2010). Epigenetic regulation of Mash1 expression (PhD thesis). Imperial College London. OCLC 692496195. 1 2 Ribeiro Lemos Pereira, Carlos Filipe (2008). Epigenetic events underlying somatic cell reprogramming (PhD thesis). Imperial College London. OCLC 930655569. 1 2 Piccolo, Francesco M. (2013). Reversing DNA methylation by heterokaryon-mediated reprogramming (PhD thesis). Imperial College London. OCLC 892860883. 1 2 Arney, Katharine L.; Fisher, Amanda G. (2004). "Epigenetic aspects of differentiation". Journal of Cell Science. 117 (19): 4355–4363. doi:10.1242/jcs.01390. PMID 15331660. 1 2 Arney, Kat (2010). "Ada Lovelace day – Professor Amanda Fisher". katarney.wordpress.com. Archived from the original on 2013-11-16. 1 2 Anon (2001). "EMBO MEMBER: Amanda Fisher". people.embo.org. Heidelberg: European Molecular Biology Organization. 1 2 3 Anon (2003). "Professor Amanda Fisher FRS FMedSci". acmedsci.ac.uk. London: Academy of Medical Sciences, United Kingdom. ↑ Azuara, V; Perry, P; Sauer, S; Spivakov, M; Jørgensen, H. F.; John, R. M.; Gouti, M; Casanova, M; Warnes, G; Merkenschlager, M; Fisher, A. G. (2006). "Chromatin signatures of pluripotent cell lines". Nature Cell Biology. 8 (5): 532–8. doi:10.1038/ncb1403. PMID 16570078. ↑ Brown, K. E.; Guest, S. S.; Smale, S. T.; Hahm, K.; Merkenschlager, M.; Fisher, A. G. (1997). "Association of Transcriptionally Silent Genes with Ikaros Complexes at Centromeric Heterochromatin". Cell. 91 (6): 845–54. doi:10.1016/S0092-8674(00)80472-9. PMID 9413993. ↑ Kosak, S. T.; Skok, J. A.; Medina, K. L.; Riblet, R; Le Beau, M. M.; Fisher, A. G.; Singh, H (2002). "Subnuclear Compartmentalization of Immunoglobulin Loci During Lymphocyte Development". Science. American Association for the Advancement of Science. 296 (5565): 158–62. doi:10.1126/science.1068768. PMID 11935030. ↑ Anon (2002). "Amanda Fisher receives EMBO Gold Medal". scienceblog.com. Retrieved 2014-05-25. ↑ Fisher, Amanda Gay (1984). Surface antigens expressed during myelopoiesis (PhD thesis). University of Birmingham. OCLC 757133182. 1 2 3 4 Anon (2016). "Lymphocyte Development". csc.mrc.ac.uk. MRC Clinical Sciences Centre. Archived from the original on 2016-04-28. Retrieved 2016-11-25. ↑ Cobb, Bradley S.; Hertweck, Arnulf; Smith, James; O'Connor, Eric; Graf, Daniel; Cook, Terence; Smale, Stephen T.; Sakaguchi, Shimon; Livesey, Frederick J.; Fisher, Amanda G.; Merkenschlager, Matthias (2006). "A role for Dicer in immune regulation". Journal of Experimental Medicine. 203 (11): 2519–2527. doi:10.1084/jem.20061692. PMC 2118134 . PMID 17060477. ↑ Fisher, Amanda G.; Feinberg, Mark B.; Josephs, Steven F.; Harper, Mary E.; Marselle, Lisa M.; Reyes, Gregory; Gonda, Matthew A.; Aldovini, Anna; Debouk, Christine; Gallo, Robert C.; Wong-Staal, Flossie (1986). "The trans-activator gene of HTLV-III is essential for virus replication". Nature. 320 (6060): 367–371. doi:10.1038/320367a0. PMID 3007995. ↑ Anon (2002). "Amanda Fisher receives EMBO Gold Medal". news.bio-medicine.org. Retrieved 2014-05-25.